Nihon buyoh (Japanese Classical Dance) is both the dance of the Japanese kabuki theatre and the dance of the geisha. It is a traditional art form stemming back to kabuki's origins in the early 17th century and has developed into a detailed form of dance that uses many types of music, and incorporates storytelling, character, pantomimic gesture and virtuoso movement patterns. The term nihon buyoh (often romanized as nihon buyô or nihon buyou) simply means "Japanese dance." It is a fairly recent term created to categorize a number of kinds of dance that are inter-connected by their history and physical lexicon. 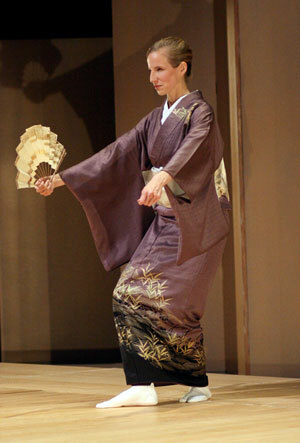 Nihon buyoh is performed in concerts by professionals and amateurs, at private parties or public concerts by geisha (professional female performers of traditional arts), and by professional actors in full dance plays at the kabuki theatre. Nihon buyoh is performed by both men and women, and the dances themselves are either onnagata (female form) or otokogata (male form). The dancer performs either a male or female character when they dance, and at times the dancer can play multiple characters through a dance switching between male and female forms. In otokogata (male form) the elbows are held up and out, the knees bent over the toes. In onnagata (female form) the elbows are low and in, and the knees are held together. The movements of nihon buyoh always reflect character and story. Some dances are more about atmosphere than story, but there is always some kind of character involved. Some movement kata (forms) are quite mimetic, and obviously depict a concrete action (like a flower opening, or pouring sake into a glass) while others are more decorative and abstract. 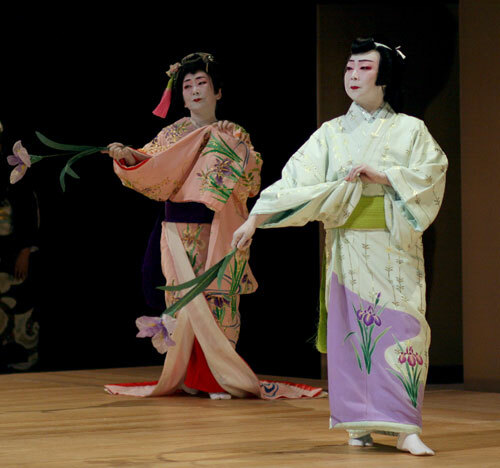 There are two main categories of dances in nihon buyoh: odori, the style of dance used in kabuki is considered lively and active, and mai, a Kamigata style (from the Kyoto/Osaka area), is more introspective and involves slower more circular movements. All nihon buyoh is based on kata - set forms that have been created and passed down physically and orally from sensei to deshi (master to disciple). One learns nihon buyoh by copying one's teacher - standing behind one's teacher and mimicking his or her movements until one learns an entire dance. A student then learns one entire choreography after another, and in so doing, develops a physical lexicon of the forms of the dance. There are hundreds of ryû of nihon buyoh - the term ryû meaning tradition, stream, school, or lineage. 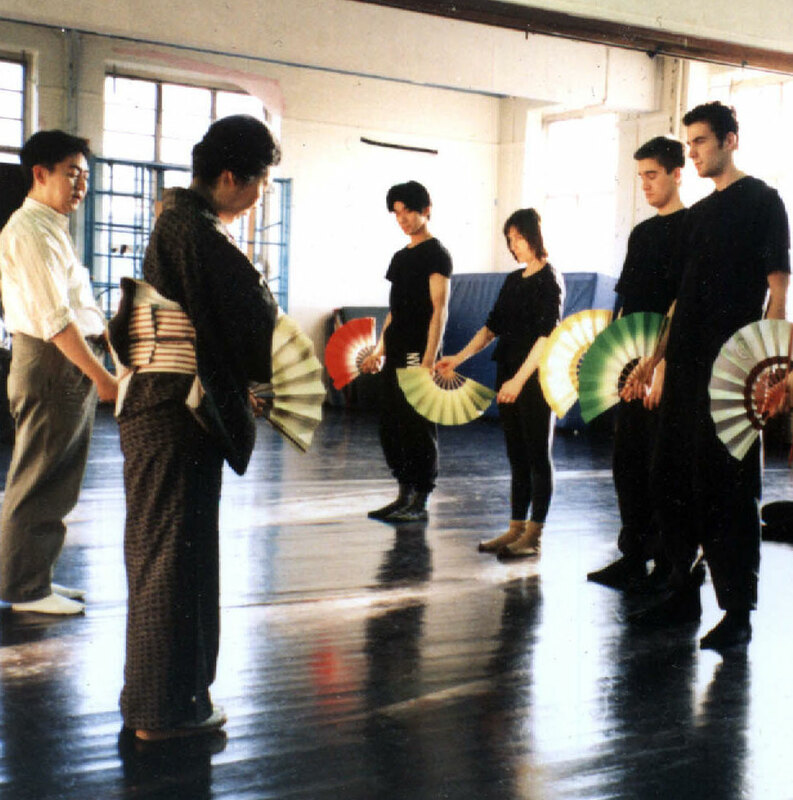 TomoeArts has its origins in the Fujima Kanemon tradition - part of the Fujima-ryû. 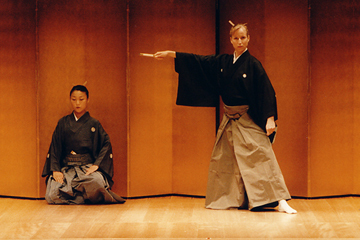 The artistic director, Colleen Lanki, has studied nihon buyoh for over a dozen years, first under master dancer and teacher Fujima Yûko (1929-2003), and now with Fujima Shôgo. She dances both onnagata (female form) and otokogata (male form) and has performed dances connected to many different types of music. She became a natori of the Fujima School in 2001, taking the professional name Fujima Sayû. 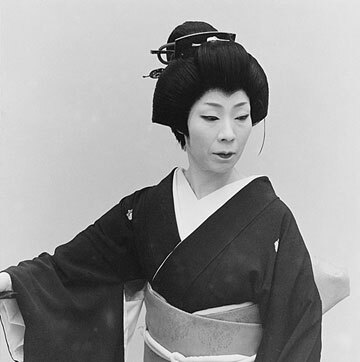 Fujima Yûko began a troupe she called Hisagokai which would do workshops and performances for foreign embassy audiences in Tokyo and public audiences abroad. Yûko-sensei had a dream that would see the forms and aesthetics of nihon buyoh spread internationally. TomoeArts was founded in part to help realize that dream.